This week, we shared the story of Oliver’s Vegetables. We looked at the vegetables in the story and talked about what they looked like. We used the vegetables to make printing pictures. The children also drew pictures of their mummys and made cards, we hope you like them. 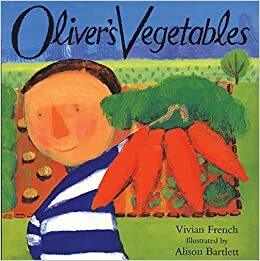 Next week we will be continuing to talk about Oliver’s vegetables. We will be talking about which vegetable we would like to eat. In PE we will also be practising climbing on the play trail equipment and balancing. At the end of the week we will be cooking Easter nests. At home, you could eat some vegetables from the Oliver’s vegetables story. Oliver eats carrots, cabbage, spinach, rhubarb, peas, potatoes and beetroot. Talk about what they look like and taste like. Play on the climbing equipement at the park. 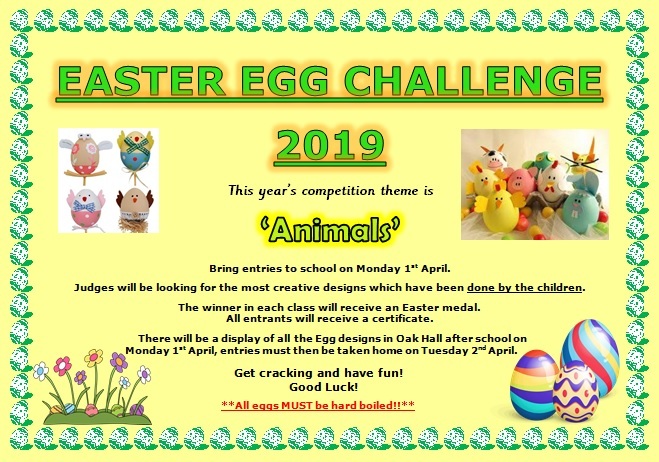 Decorate an egg to enter into the Easter Egg competition. Reminder – Friday the 5th April is the last day of term before the Easter holiday. School finishes at 2.30pm. There will be no after school club on this day. Tapestry – Please keep putting things onto Tapestry. We enjoy hearing about what the children have been doing and the children love to share their pictures with their friends. GATES: When leaving the Nursery please make sure that you close all of the gates behind you. Thank you. ATTENDANCE: It is important that your child attends school everyday and arrives on time. They will miss important learning time if they are late. SNACKS: Please do not put any snacks in this bag as the children have fruit provided at snack time. NUTS: Please make sure that your child does not bring nuts to school. This is very important as we have children in our classes that are allergic to nuts. We learnt about different celebrations including Bonfire night, Diwali, Autumn and Christmas. We went to the Nature area and had a visit from Tigger the dog from the Dogs Trust. At Christmas we made lots of decorations, sang Christmas carols to our friends and family and had a visit from Father Christmas! We started Nursery and started to make lots of new friends. Summer 2 – Let’s go on holiday!